Summer isn't over yet, and there is still time to take a short day trip to cool down at a good old fashioned swimming hole! 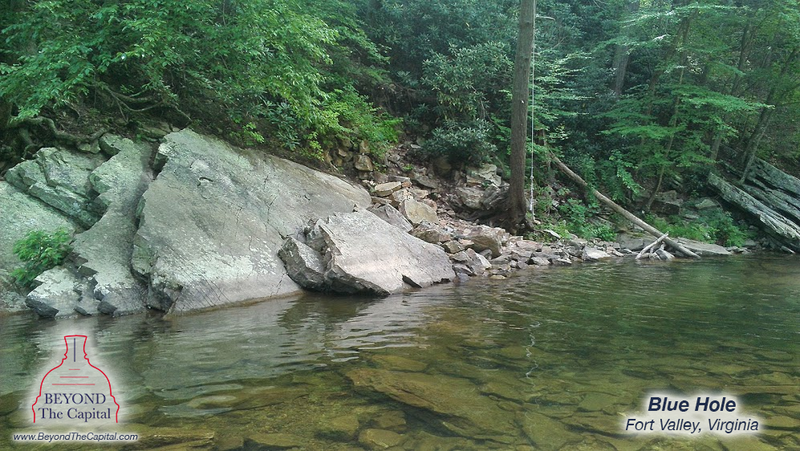 Located just an hour and 15 minutes from the city are 3 fun swimming holes that really hit the spot in the summer (or spring) in the Elizabeth Furnace area. Plus you can add swimming as a way to cool down from one of the many activities in the area including hiking, picnicking, fishing, rock climbing, camping and more. So wade around, pop up a chair in the water, or fly through the air off a rope swing. Just make sure you get down to Elizabeth Furnace to check these out before summer ends. This area may not look like much in the picture or when you arrive but this is actually one of the deepest sections of Passage Creek in this area. Just past the rope swing is a "hole" hence the name, and the water there is typically around 7 feet deep. So unless you are a giant there are places where you will have to doggy paddle. But don't worry, there are also lots of places to stand up as well. One of the fun parts about this spot is that there is a rope swing. It is fun a few times and a great way to get yourself into the cold water for the first time. Yes, this water is often pretty pretty pretty cold. There is not very much room on shore here, and if other people are around it can get annoying trying to walk by and not get everyone wet. Blue Hole is on Rt. 678 about 2 miles from Rt. 55. You will have to make a turn around somewhere as the only place to park is on the creek side of the road. The parking area gives maybe 4-5 cars barely enough room to pull off of the main road to park. It is also hard to find sometimes but if you look through the trees you will see the rope. 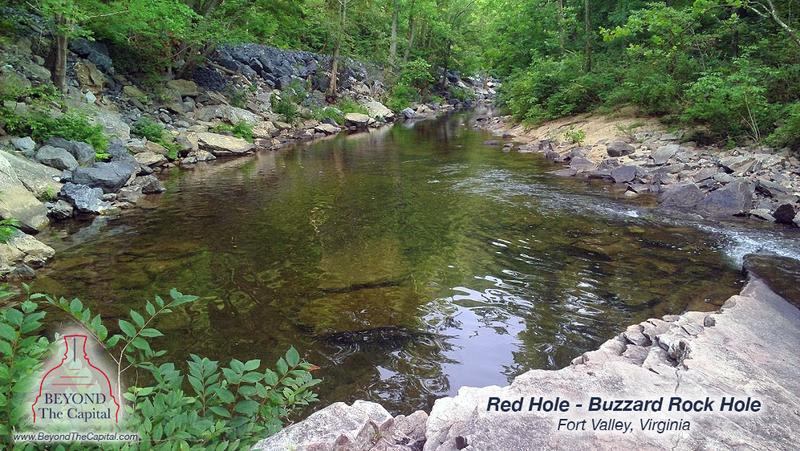 Red Hole offers you another spot to cool off but with a lot more room to maneuver. At this spot there is a giant flat rock surface where you can lay out in the sun or have a little picnic. You can also sit int he running water of the stream area and cool down too. At the bottom of the stream there is a little pool/cove area where the water is typically around 5 feet deep or maybe even less. Unlike blue hole, this is not a place to jump in. The water isn't very deep and there are rocks all over. Nevertheless it is a nice spot to cool off (or to go fishing). This is a little easier to find but you have to park farther away and walk down the semi-dangerous windy one lane road to get there. Be careful! 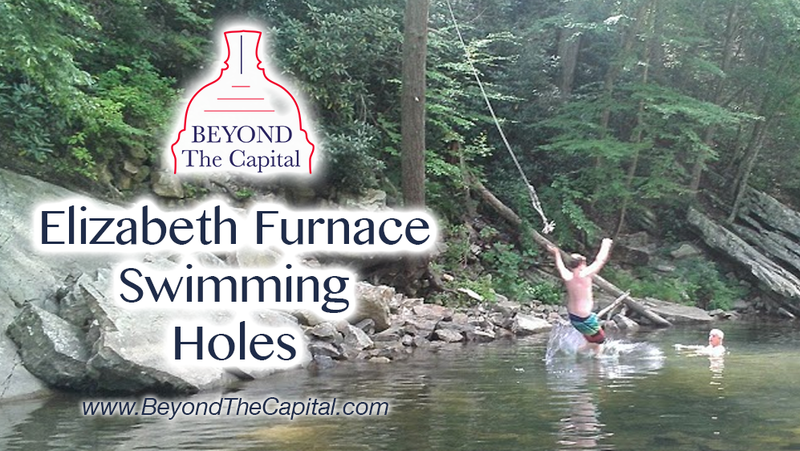 The final place to swim and enjoy the water is down at the Elizabeth Furnace Day Area. While this swimming hole is not one to drive down to specifically see, it is conveniently located in a cool park with lots of picnic tables and hiking trails. Its a nice place to cool down while still being able to have a barbecue and run around and play games. Plus if you are camping at the campground, you can walk on over and enjoy the water without having to drive or park anywhere. 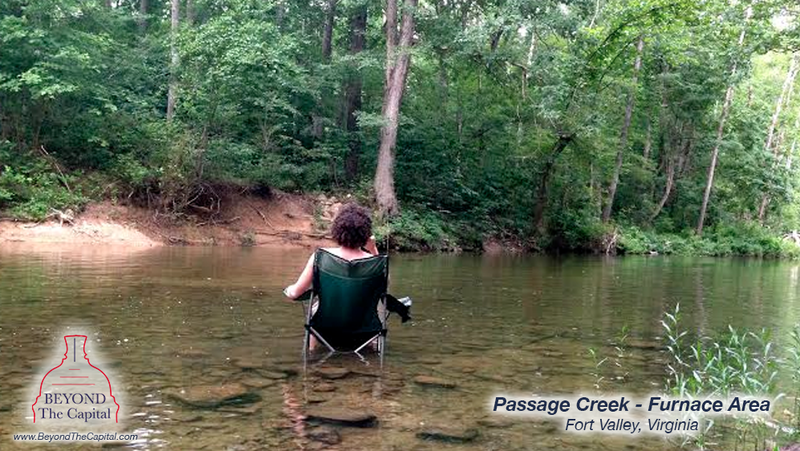 Nothing beats just sitting in the creek with a beverage on a hot summer day! The water is fairly deep by the bridge near the entrance, but you can also just follow the stream on the entrance side down a path and pick your own little spot (across from the campground is the best). 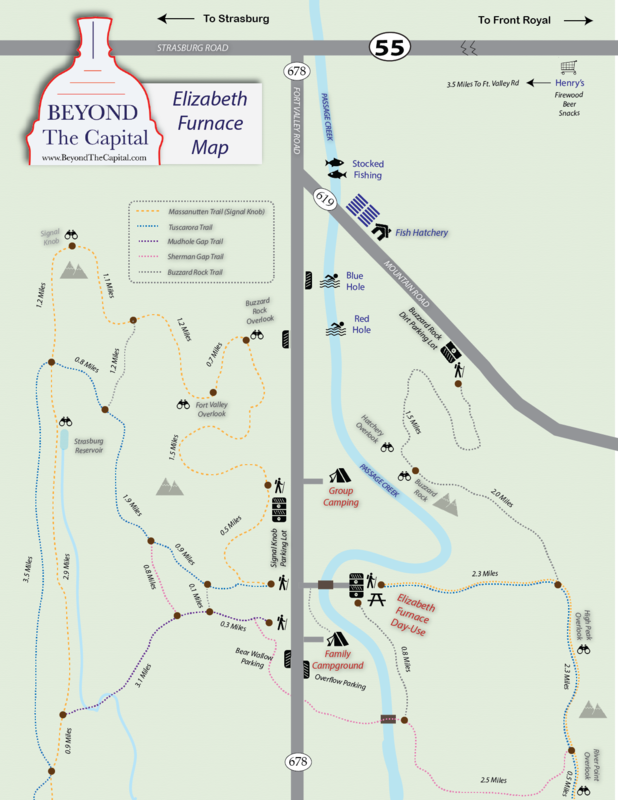 The Elizabeth Furnace Day Area is 4 miles down Rt. 678 from Rt. 55. There is a big sign on the right telling you to turn into the park. You drive over the bridge and park in the large lot, and then walk back towards the bridge and the creek. So there you have it. Three neat swimming holes just over an hour outside the city and close enough to where you can hit all 3. There are also lots of great things to do in the area from long hikes to mountain biking to rock climbing to camping, so you can make swimming just a part of the trip. 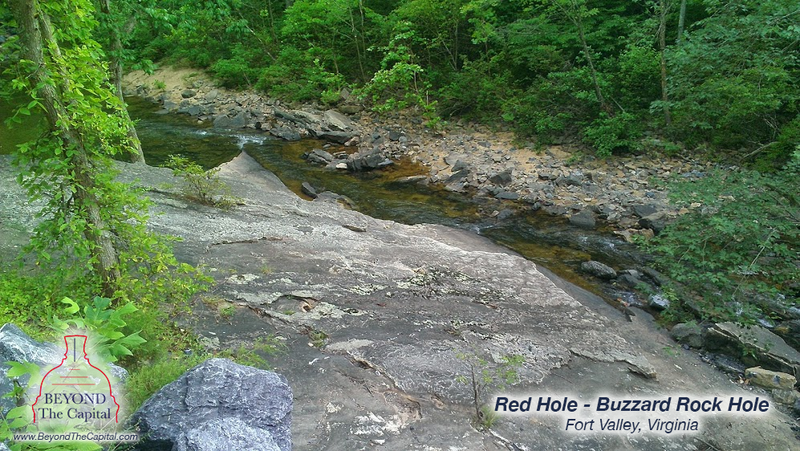 I recommend doing the short Buzzard Rock Hike and then cooling down at Blue Hole after before heading home. Or spend the night!